I recently got a good deal on little 11' fishing boat, which came with a little 3.3HP motor. I've always wanted a tiny boat - just something I can take out on a local lake and troll around on. When I found this on craigslist, I figured it would be perfect. Shortly after I picked it up, I threw it onto my little flat bed trailer, strapped it down with my ratcheting tie-downs, and drove out to the lake. Unfortunately, I didn't give much thought to how much tension the sides of the boat could take as I tied it down, and about a block away from the lake, the tie-down going from port to starboard (that's left-to-right for you non-boat people) collapsed the side of the boat. The break looked like a shark had taken a bite out of the boat... so I re-did the tie-downs (only tying down the front and back), drove the boat back home. After a bit of jig-saw action, a sheet of aluminum, some nuts and bolts, and some roofing tar, I got it patched up. As you can see in the photo, even with the boat full, the patch is well above the water line. Anyhow, I never pictured myself to be a fishing kind of guy, chiefly because I can't catch fish (I lack both the patience and the know-how), but also because I've always associated fishing with game fishing, which makes no sense to me. It's similar to my inability to understand people who hunt for trophies. I don't get putting a deer head on a wall. I just want to catch food. I want to go to a lake and bring home dinner for the family, and know that it was done with little more than a fishing pole and a worm. I enjoy sitting out on the boat, but I think it's a little large for a personal fishing vessel. 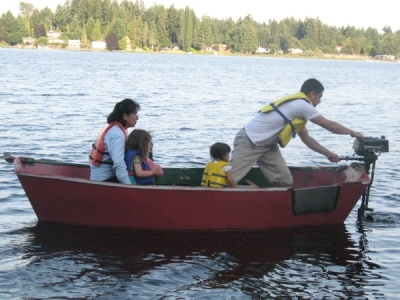 This one is big enough for my entire family, but I have a larger motor boat (currently not running well, but I'll get that squared away) for family outings. I'd like a tiny boat - something just big enough for me and my fishing gear - something like a mouseboat, only a little larger and with a place to stick a motor. So... my plan is to sell this 11' boat and use the money to buy the materials necessary to build a smaller boat. I should be able to build a mouseboat for under $30, provided I find some cheap glue, sealant, and paint. Hopefully this little project doesn't leave me too wet. After you factor in all those (and more) variables you choose a lure or bait and hope it works. When you're able to land a lunker it's sweet. Mainly it's a challenge thing. Catching some fish is a easy as a hook in the water. Other fish are smarter and take much more 'luring' if you will. Kind of like basketball. No eating involved but a lot of skill. I get the whole science piece - I like that aspect. But I think there's a lot of competitive machismo nonsense built into sport fishing or sport hunting. It's all big-johnson talk in the end, which is strange, awkward, and screams inadequacy. At least, that's what I've witnessed. I just want to catch food. Well, what you are calling comraderie, I think I also call comraderie. I think we're talking about different things. I think that it would be fun to go fishing with some buddies and shoot for a personal best. And then eat that personal best. However, I was referring to the whole trophy-head mentality that some gamesmen get into, where it seems like the aim is to be the guy with the biggest ::ahem:: and stick it out there for everybody to see. I honestly can't think of anything more childish. Except maybe being the guy that stares at that ::ahem:: in envy.